The Keysight 34401A is available to buy refurbished used or rent, usually from our UK stock. Click here to download the Keysight 34401A datasheet. The Agilent Technologies 34401A multimeter gives you the performance you need for fast, accurate bench and system testing. The 34401A provides a combination of resolution, accuracy and speed that rivals DMMs costing many times more. 61/2 digits of resolution, 0.0015% basic 24-hr dcV accuracy and 1,000 readings/s direct to GPIB assure you of results that are accurate, fast, and repeatable. For systems use, the 34401A gives you faster bus throughput than any other DMM in its class. The 34401A can send up to 1,000 readings/s directly across GPIB in user-friendly ASCII format. You also get both GPIB and RS-232 interfaces as standard features. Voltmeter Complete and External Trigger signals are provided so you can synchronize to other instruments in your test system. In addition, a TTL output indicates Pass/Fail results when limit testing is used. To ensure both forward and backward compatibility, the 34401A includes three command languages (SCPI, Agilent 3478A and Fluke 8840A /42A), so you don’t have to rewrite your existing test software. An optional rack mount kit is available. Commonly accessed attributes, such as functions, ranges, and resolution are selected with a single button press. Advanced features are available using menu functions that let you optimize the 34401A for your applications. The included Agilent IntuiLink software allows you to put your captured data to work easily, using PC applications such as Microsoft Excel® or Word® to analyze, interpret, display, print, and document the data you get from the 34401A. You can specify the meter setup and take a single reading or log data to the Excel spreadsheet in specified time intervals. Programmers can use ActiveX components to control the DMM using SCPI commands. 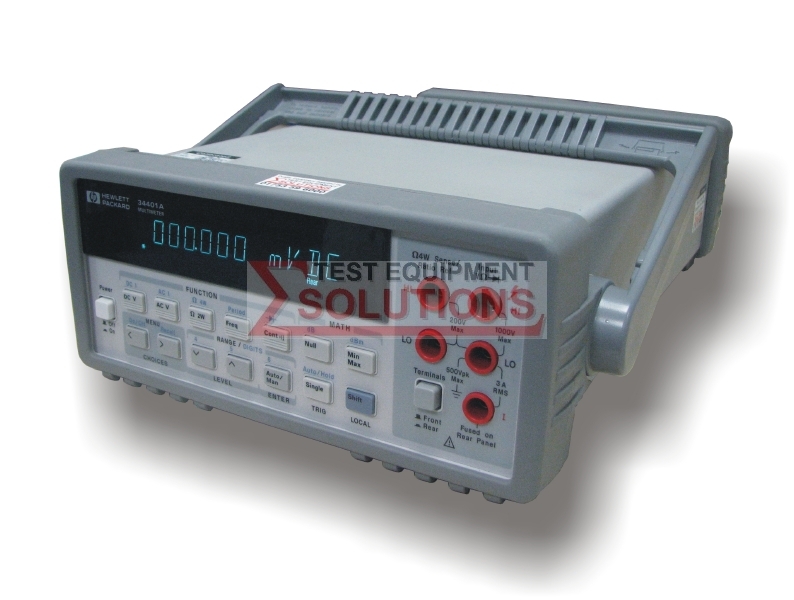 We offer the refurbished used Keysight (Agilent) 34401A 6.5 Digit Digital Multimeter for sale and rental. The Keysight 34401A is fully tested and refurbished in our in-house ISO9001 calibration laboratory. We supply manuals, accessories, full warranty and a free-of-charge Certificate of Conformity. We can also provide the Keysight 34401A with a fresh calibration for a small additional charge. If you have under-utilised test equipment talk to us about trading-in or part-exchanging it towards the Keysight 34401A or other refurbished test equipment.